While the real cost of losing an employee is difficult to measure and can vary widely depending on job complexity, one study by the Center for American Progress found that turnover for workers earning less than $50,000 annually cost 21% of their annual salary. With the U.S. economy nearing full employment, competition for talent is getting fierce, which means that attracting and retaining quality talent is now more important than ever. Luckily, there are affordable ways to make your company more competitive at attracting and retaining talent. Offering higher quality, affordable, comprehensive benefits has never been more important. And one of the most important and affordable benefits that you can improve is your company’s 401(k). 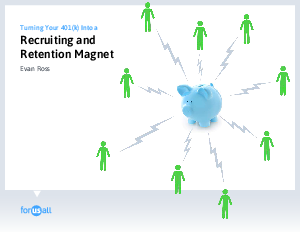 But just how does one turn their 401(k) into a powerful recruiting and retention tool? In this White Paper, we’ll walk you through five strategies that forward-thinking companies are already using to turn their 401(k)s into strategic business drivers that attract and retain employees.